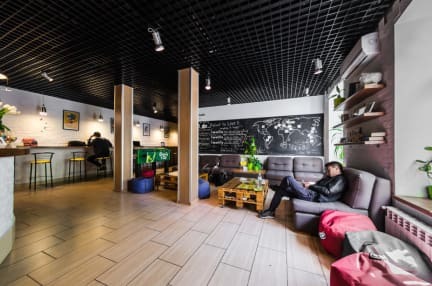 O lugar muito bom, funcionários super tranquilos e super prestativos, o bar e restaurante do hostel muito Bom, os funcionários sempre com um sorriso no rosto e sempre bem prestativos e a comida muito boa recomendo muito e super perto do centro. I like the hostel. Good Russians friends a do there. Good Hostel. Really nice hostel, well located, helpful crew (special thanks to Natalya). Perfect place to stay! Highly recommend! The staff is great, I followed all their tips and had a great time in Kyiv. The room was as expected with big private lockers. It’s difficult to meet people in the hostel although they have a bar/restaurant downstairs many locals go and don’t really interact with guests. Passei apenas uma noite, bem recebido as 2h da manhã. Recepção aberta! Banheiro e quartos limpos. Uma das camas que reservamos estava usada. Solicitamos troca e fomos prontamente atendidos. Estavamos em dois e ficamos um em cada quarto. Como era apenas uma noite nao houve problemas. Good hostel, with a very nice reception staff, in a good location. But the bathroom need to be clean more often. The cleaning wasn't so good, bathrooms were frequently wet. The single room is underground, with no sun (it's more expensive and has less comfort). The really positive thing is the restaurant inside the hostel. It's well located, but it's not the main "City center"